While it’s not officially summer (not until mid-June anyways), the heat in Houston has convinced me otherwise. I thought what better way to welcome summer than with an old school summertime treat like strawberry shortcake. I must confess that I don’t have any memories of eating strawberry shortcake growing up, but for some reason I still feel the nostalgia that this classic American dessert is known for. Perhaps it’s because I grew up knowing this Strawberry Shortcake, so a dessert with the same name somehow brings me back to my childhood. That might be a bit of a stretch, so who knows–I’m no psychiatrist. The old-fashionedness of this dessert and its wonderful simplicity really speak to me. 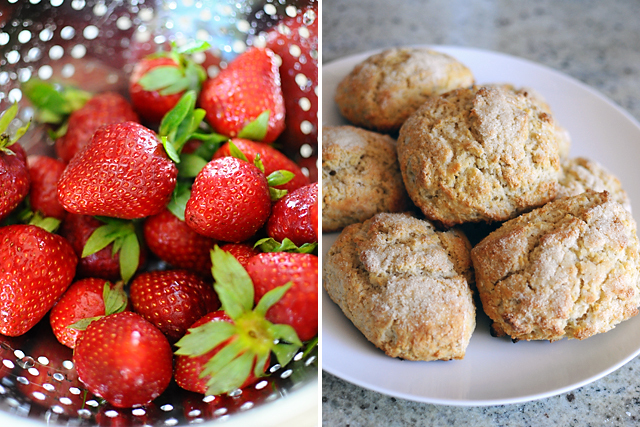 I can see why the combination of homemade biscuits, sweet strawberries, and fresh whipped cream has stuck around for so long–it’s totally delicious! Heat the oven to 425 degrees. In a large bowl, whisk together the all-purpose flour, oat flour, 1/3 cup sugar, baking powder, and salt. Add the cold butter and use a pastry cutter to cut the butter into the dry ingredients, until the mixture resembles coarse meal. Add the milk and mix together with a rubber spatula until all the dry mix has been moistened (do not over-mix). On a lightly floured surface, turn out the dough (it will be sticky) and with floured hands pat it into about a 4 by 8-inch rectangle. Flour a large knife and cut the rectangle into 8 squares. Transfer the biscuits to a baking sheet, sprinkle the tops with the remaining tablespoon of sugar, and bake for about 15 to 20 minutes, until the biscuits are nice and golden. Let them cool on the baking sheet. When ready to serve, split the biscuits in half using a serrated knife and then spoon on some sweetened strawberries and whipped cream. Toss the strawberries with the sugar in a medium bowl. Let the mixture stand for at least 20 minutes (or up to 1 day). Keep them covered and refrigerated until you need them. In a deep bowl, whisk the cream until it has reached soft peaks (I use a hand mixer). Add the sugar and whisk again until the soft peaks have returned. 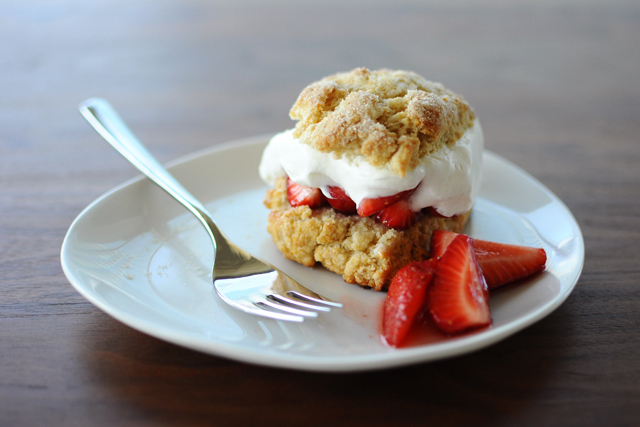 Mmm… I love that you make shortcake the proper way (in my opinion). My husband seems to think that it should be more of a cake.. silly him. Your photos are beautiful too.